I have another fun and easy make over to share and I'm loving it! I really enjoy up-scaling things to give them new life and some of them become something truly awesome! MANY years ago I bought a CD holder for my younger daughter. It is made of solid unfinished wood and dowels, heavy and sturdy. It's still in perfect condition, but hasn't been used in ages. I couldn't bring myself to get rid of it and just knew one day a great idea would find it's wooden goodness! 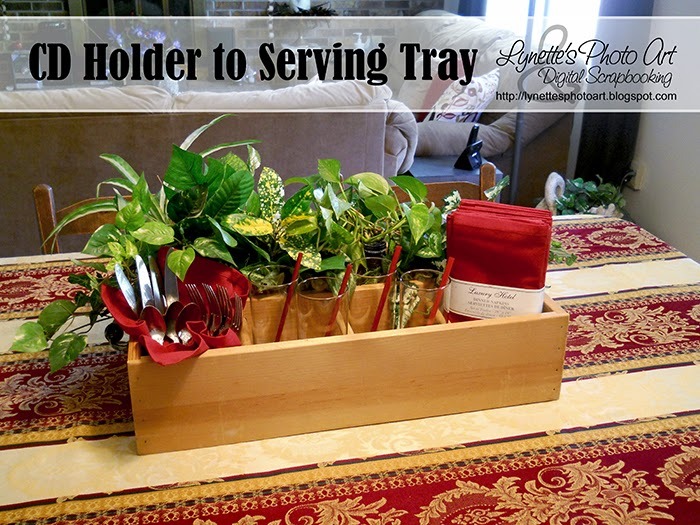 I love all the rustic trays, divided servers and organizers that places like Pottery Barn sell. I adore being able to put flowers and/or green plants, herb gardens in the same serving "tray" that carries my silverware, glasses, napkins, straws, etc. 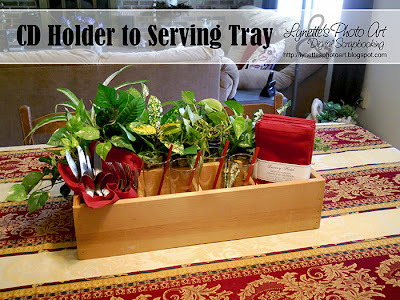 It makes a lovely centerpiece and a very handy server. 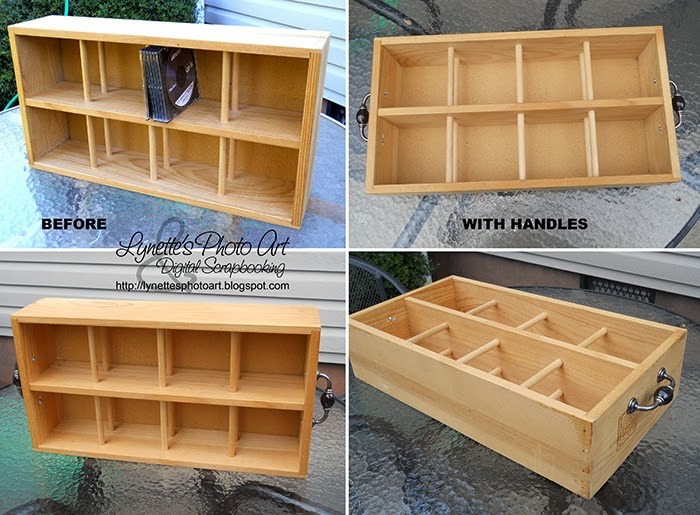 It could be a shoe organizer sitting on it's side in an entry hall or a child's closet. On it's side, you also have a charming place to display things on it's shelves in the rest of the house! That's what I saw in this neglected CD holder! I had two of my awesome and sturdy handles from Hobby Lobby left from remodeling my kitchen that I just finished. Check out The Accidental Remodel here. 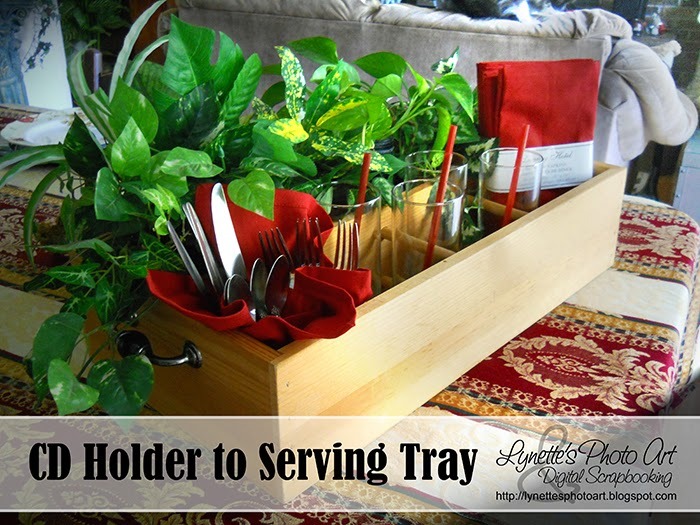 They were perfect for the size and weight of this "tray". I measured and drilled holes, then attached the handles to each end. Gorgeous! One end came with a wood burned logo on it, so that's even cooler! It's perfect! It's large enough to make a statement and hold a lot, but not too large. For now I'm leaving the wood with it's weathered unfinished look, but it would take no prep at all to paint, stain or wax it into an amazing finish. I could even mask off a rectangle on the long sides and paint chalkboard faux "plaques" on it! I could leave it that way or I could trim it with some narrow trim to look like it was actually an attached panel! Love that idea! But I really love how it turned out for now. My husband even made a big point of telling me he liked it and that says something! No, this vintage CD holder was never headed for the landfill, but now it's a treasure and such a unique variation on all it's massively expensive brothers for sale at our favorite stores!